The 161st Brigade was part of the 54th ( East Anglian) Division during World War One. The Brigade comprised of the four Essex territorial battalions 4th, 5th, 6th and 7th Essex . 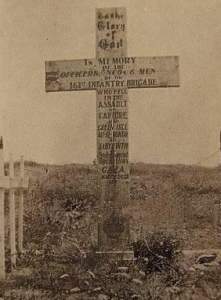 After the battle the Brigade erected a wooden cross as a memorial to their fallen colleagues.